William B. Aitken was born on December 24, 1810, the son of John and Lydia Bennett Aitken. John had been educated at the University of Edinburgh and his family had thrived upon arriving in New York. Young William was admitted to the Bar of New York in 1832. Following his father's death he inherited parcels of real estate, including the two small buildings at Nos. 188 and 190 Duane Street. No. 188 was a small, frame house which may always have had a store at street level. In 1823 Catharine Insley's dressmaking shop was here while John I. Riker lived upstairs. He was a "smith" who worked at No. 116 Reade Street. No. 190 next door was a more substantial three-story brick building. In 1829 Mary Smith ran the store at ground level and upstairs two widows, Mary Conklin and Catharine Gurnee, lived in rented rooms. By the outbreak of Civil War the Duane Street block had become almost entirely commercialized. The space that had housed Catharine Insley's genteel dressmaking establishment in 1823 was now home to F. W. Steuben's "liquor-store" (most often a polite term for saloon). No. 190 now held John Reed Jr.'s Kerosene Oil Manufactory. At a time when every house and office in New York City depended on kerosene oil lamps for illumination, Reed's business was a profitable--and highly dangerous--one. Disaster struck around 1:00 on the afternoon of January 3, 1863 when fire broke out in the factory. The New York Times reported "The alarm was promptly given, and the firemen were immediately on hand, but owing to the combustible nature of the stock in the building, the entire premises were soon destroyed." Just as the flames had broken through the roof, a tremendous explosion occurred, blowing the front windows into the street. "In a few minutes thereafter the entire building was a sheet of flame, and it shortly after was a mass of ruins." One of Reed's employees, Jacob Menzes, was in the basement at the time of the explosion. Miraculously, while he was seriously injured about the face and head, he survived. Steuben's saloon was "considerably damaged, principally on stock, to the amount of $1,000." Reed's damages were, of course, more severe, amounting to $7,000 (more than $140,000 today). But unlike Steuben, who had no insurance at all, he was covered for about half that amount. The Times noted "Nos. 188 and 190 belong to Wm. B. Aitken, and are fully insured in City Companies." Within the decade the wholesale produce district was overtaking the area. William B. Aitken (who had by now achieved the position of Chief Clerk of the Surrogate's Court) reacted to the changes by updating the Duane Street properties. On May 5, 1876 his architect, Theodore A. Tribit, filed plans for extending No. 190 to the east, removing that wall, and "iron columns, &c. inserted." The plans were remarkably understated. In fact, No. 188 was demolished and No. 190 was seamlessly doubled in size and a fourth floor added. A simple cast iron storefront from the foundry of M. H. Howell now supported a new facade of red brick trimmed in brownstone and topped with a pressed metal modillioned cornice. The extensive alterations cost Aitken $8,500, in the neighborhood of $200,000 today. Initially Aitken had just one tenant in the remodeled building, Fennell & Pye. The partnership of George Fennell and Henry B. Pye was, expectedly, produce dealers. By the mid 1890's there were three tenants in the building, all produce commission merchants: John C. Huser & Bros., John F. Mattfeld, and R. W. Dixon & Son. In the 21st century, when exotic foods reach markets around the globe within hours, it can be difficult to imagine the excitement caused when tropical fruits or foods from the West or South became available to New Yorkers. On August 13, 1895 The New York Times ran a front-page headline reading "PEACHES NOW IN MARKET." The article's reporter went to No. 190 Duane Street to interview R. W. Dixon about the sensation. He gushed on about the fruit saying in part, "New-York really cannot get too many first-class peaches. We have a deep love for peaches, and we are bound to get them if such a thing is possible. The rich class like the big, red-cheeked peaches that seem to have stored up and condensed sunshine, and it gets them by paying fancy prices. But there are some smaller, unpretentious looking peaches that are of just as good flavor and even finer substance that the poorer classes have learned to value." When the Aitken estate sold the building to Frederick Goldstein in April 1907, the Real Estate Record & Builders' Guide remarked "The property has not changed hands for over a century." At the time of the sale the "butter and egg" merchants were elbowing their way into the produce district. The highly perishable nature of dairy products (and the often unscrupulous nature of the dealers themselves) required vigilance on the part of government inspectors. Frederick Goldstein inherited one butter and egg man when he bought the building. An inspection of the facility that summer led to Louis Schuer's arrest. The Times reported on August 13 that he was being held on $500 bail "on the charge of selling bad eggs to retailers." The article noted "Supervising Inspector Fuller of the Board of Health is making a special effort to stop the sale of bad eggs." At the end of World War I John C. Huser & Bros. was still in the building. The firm shared the address with H. Hamilton, dealers in canned goods; olive oil dealer Francis J. Bigley; the Lappin Tea Co., and three "butter, cheese and egg" merchants, Solomon Goldstein & Co., M. Levine, and John H. Rusch. 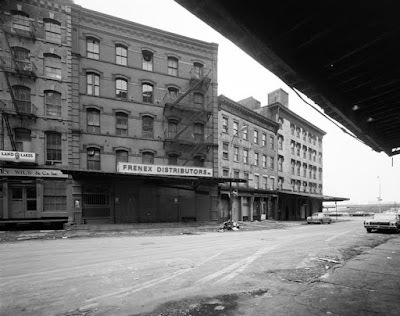 While other districts like the garment, millinery, and shoe districts, for instance, moved northward during the 20th century; the butter-and-egg and the produce districts stayed in the Duane Street neighborhood for decades. John H. Rusch was still in the building in the 1920's; and the cooperative G. L. F. Egg Marketing Service, Inc. was formed here in 1934. While no battles were fought on U.S. soil during World War II, Americans nevertheless endured hardships, albeit decidedly less life-threatening. Women had to do without silk stockings, and families dealt with rationing of refined sugar and wheat, for instance. The butter and egg market was affected by the banning of butter, resulting in the invention of oleomargarine, and imported cheeses became a delicious pre-war memory. So it is perhaps not surprising that following the war, on March 20, 1949, Jane Nickerson wrote a spread in The New York Times Sunday Magazine entitled "Latest News of Cheese." To reintroduce readers to foreign cheeses she visited Alpert's Cheese Corner at No. 188 Duane Street, run by Phil Alpert. The inventive cheese purveyor had come up with a clever marketing scheme. Nickerson noted that his shop "specializes in mailing cheese (including any unheard-of-type one might mention)." In 1960 the ground floor of No. 188-190 was converted for a luncheonette for workers in the neighborhood. The Infinity Company, a natural foods importer, distributor and manufacturer, was started in a space upstairs in 1965. The Tribeca renaissance caught up with the building in 1986 when the upper floors were converted to one loft dwelling per floor. Then in December 2001 Les Migrateurs, a modern furniture store based in Paris opened in the ground floor. Where once workers loaded horse-drawn drays with crates of eggs, trendy New Yorkers now shopped for contemporary pieces like a $4,800 dining room table. Les Migrateurs was replaced by Nili Lotan's clothing boutique in August 2006. Despite the expansive show windows within the historic cast iron storefront, the building retains most of its 1876 appearance. Still somewhat legible is Lappin Tea's painted signage from around 1918. And if you squint and strain, you might be able to read the firm's motto "The kind of tea they use in Ireland."